Today the latest EQ2 expansion released, Planes of Prophecy. It is tied to the first EQ game in lore and areas from the PoP, or rather Planes of Power, era and some from beyond. Heavy on nostalgia, we did not get to see a lot with the livestream, but if you pre-ordered you could take place in the beta, or you could check out the weekly posts on the website which highlighted the new zones. Today I've only been to the first area, an isle in the sky called The Plane of Magic. 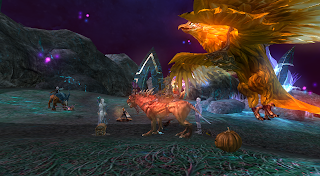 I am no lore buff when it comes to EQ, but I watched my share of EverQuest mysteries (check that channel out if you haven't, it is awesome) and I've played it for almost two decades. Still I was scratching my head with the Plane of Magic. 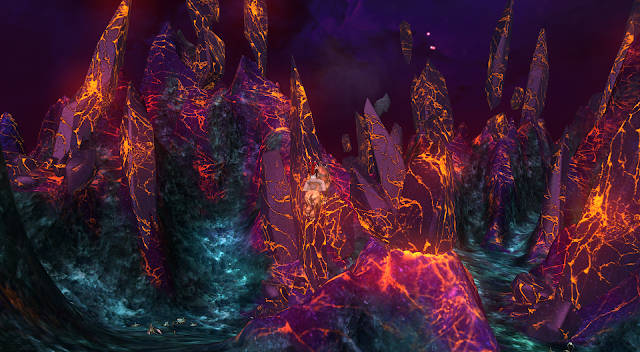 Oh, yeah, that's Arcstone in the other EQ game, or part of the Void, where that guy, Zebuxorux was chained up. It was a Prophecy of Ro area I think. I've been there, many times, though at first it didn't ring any bells. 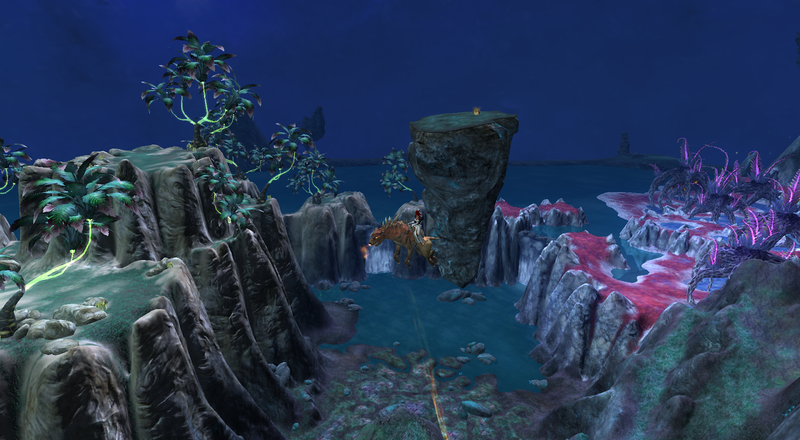 PoM is home to the goddess, Druzzil Ro. The Void was tied into Plane of Time in a later expansion if you've been gone for years it probably wouldn't be something you were aware of. You have to zone into PoT to get there. 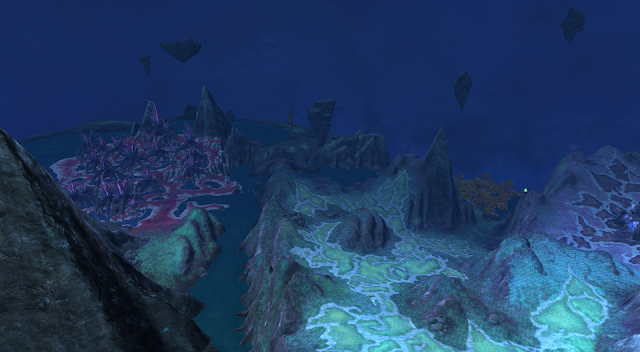 In the first game it was part of that whole Plane of Time re-mashup, within the void, which consisted of several isles such as Arcstone; which was the largest of the areas. Anyhow, Plane of Magic sounds cool but I want to see Plane of Innovation or BoT or Sol Ro Tower, those places that are so prominent in our minds. So, I find myself rushing through the plane of magic to get to see other things. And while the isle is pretty, it is not very nostalgic. 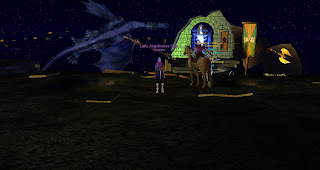 Pictured to the left is a shot of Dire and I in the Void, I dug up this gem from my screenshots of EverQuest. We were there not too long ago. Before I get ahead of myself let me offer some tips. Don't even bother grabbing panda vendor gear on any alts. Oh, and how to get there? Map travel if you're a subscriber, or take a wizard portal. I did not see any quest pop up, I just thought I'd try to travel there. I think there was a mail article sending me there, but I didn't think to check until later. Simple and easy access, no previous stuff is required to start in this expansion. Once there the first NPC you encounter is standing beside a chest. It holds the equivalent to the previous T3 gear, so on all my characters it will be needed. You really will need it if you didn't have anything up to par. So, I appreciated that from the team. It calls my alts to come and enjoy the expansion too, very nice to jump in and get rolling rather easily. I started out with my necro alt who didn't complete the last expansion timeline. Also be prepared to grind a little bit before you really get going. Get all your xp buffs on, and don't worry about deity points as much because they have changed and you no longer can purchase stats with them. Which leaves me to wonder what kind of gap that will cause? Or will the system eventually be scrapped? Wasn't a big fan of it anyhow. The plane of magic requires you to look for objectives, fly to obscure spots, and there is no built in quest tracker. Hey, we can fly though! Right off the bat. But I found some disappointment because tabbing out to the EQ2Wiki is a real immersion breaker. If it wasn't there I don't know how far I would have gotten because things are up in the air, down below and it is rather confusing. Thank you, whoever you are, for those updates to the EQ2wiki. You can't continue the story line until you do repeatable faction grinds, I would not have guessed that had I not looked on the wiki, or read the actual quest text. Not cool with the grind right off the bat. It isn't hard or bad, just boring right out of the gates. The good thing is you will easily hit the cap by questing, I'm already 102 on the first isle. So it has some flaws but I like it well enough as a huge EQ2 fan. Definitely don't see the polish or quality we saw from expansion years ago, but the team is smaller and I appreciate the fact that there is still an expansion a year, and I'm not that hard to please.... Just add quest to a tracker next time!!! I could not see a player like Dire, strapped for time, looking up things on the Wiki. It may turn away people and we need players to stay and feel welcomed. That is a fact in our aging games, we need populations for them to continue. Although for the most part his expansion is a big step in the right direction. 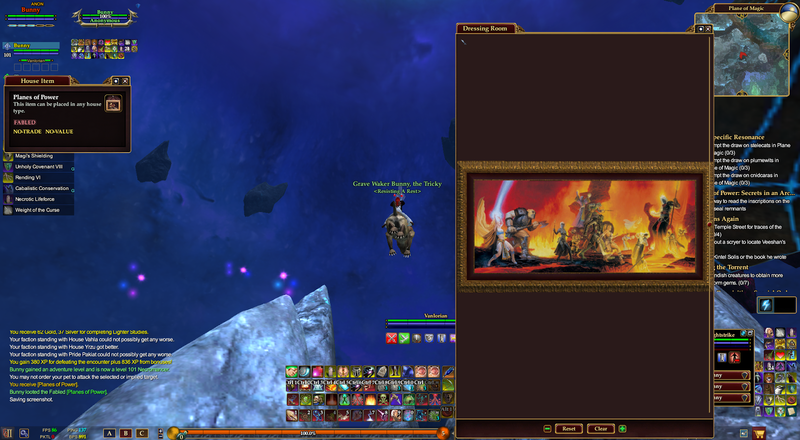 Upon hitting 101 I received a nifty painting, also questing rewards nice gear as well as some house items. I have gotten a few nice gear drops as well, everything is an upgrade. While it isn't the most gripping content it seems to be flowing well, I just can't wait to move onto the next zone. My server hasn't had any issues with too many people killing mobs for quests, I am on a lower pop premium server with this current character. My next one to play up will probably be one on my old server Antonia Bayle. As the evening wore on there were some lag spikes, probably the bulk of players getting on to play as the evening bunch logged in. My merc worked well, for the most part. I have't had any real issues with the xpac except confusion on my end, lol. That's my first impression, overall a big a thumbs up! 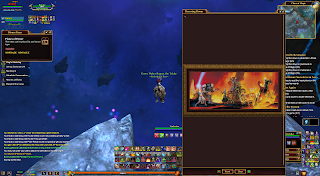 A year ago I really ripped into EQ2 for the last expansion. So far this expansion is leaps and bounds better than the last one, catch-up and alt friendly. 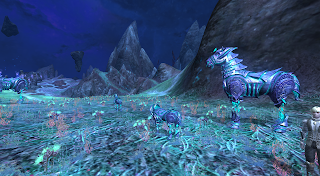 I think the EQ2 team listened to players, which is great to see. I cannot wait to progress further into the story and see more of this expansion. I think the team as small as it is and still pushing out content on a yearly schedule deserves praise for a job well done! More to come as I make more progress. It's going to take me a week just to get as far as you got in a day, I think, because I'll be lucky to scrape a couple of hours a day. Loving it so far, though.